A perennial plant that has celery like stalks that are greenish pink to dark red in color. Rhubarb is a vegetable but is generally prepared and served in the same manner as a fruit. 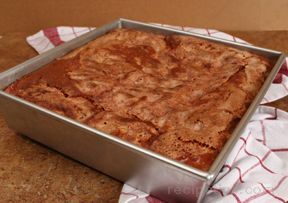 It is most often cooked and sweetened with sugar. It is called the "pie plant" because one of its most popular uses is as pie filling. 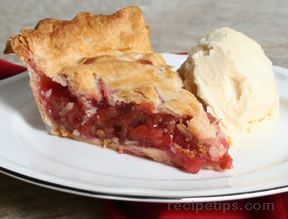 The rhubarb stalk can be eaten raw but its tart flavor deters people from eating it in that manner. The leaves of the rhubarb should not be consumed because they contain oxalic acid, which makes them toxic. There are two types of rhubarb available. Hothouse rhubarb has yellow leaves and pink to light red colored stalks that are milder in taste and not as stringy. Field-grown rhubarb has green leaves and deeper red stalks that have a more intense flavor. 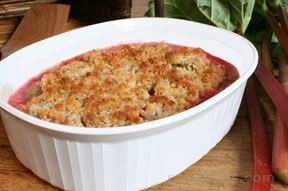 Rhubarb can be eaten raw with a little sugar sprinkled over it but it is generally cooked with other ingredients to produce a fruit dish of some type. 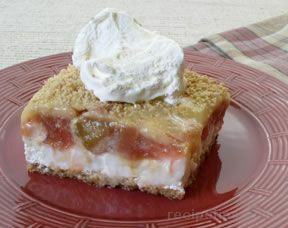 Rhubarb can be used nicely to enhance the flavor of other fruits, such as pairing it with strawberries in baked sauces or beverages. 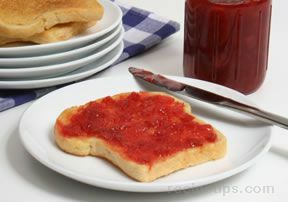 It makes a delicious pie filling and is also used to make sauce in the same manner as applesauce. 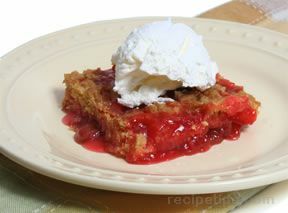 Rhubarb can also be used to make jellies, jams, cakes, muffins, and other desserts. It can also be used in savory dishes and is good as a sauce to serve with meats and fish. 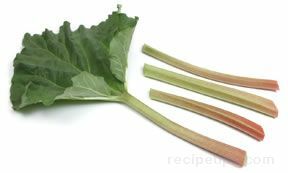 Rhubarb stalks vary from red to pink and they may also appear speckled or green. This color variation has little or no impact on the ripeness of the rhubarb. When selecting, choose stalks that are fresh looking, crisp and blemish free. Mature stalks will range from 1 to 2 inches in diameter but the smaller diameter stalks are younger and generally tenderer. If the stalks have the leaves still on them, look for smaller leaves, which is also an indication of a younger stalk. 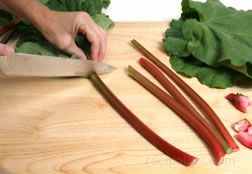 Avoid limp stalks and stalks with split ends, which are indications that the rhubarb is not fresh or that it has not been stored properly. Rhubarb is also available canned and frozen. Field-grown rhubarb's peak season is April and May and it is available through the early summer. Hot-house rhubarb is generally available January through June. Before storing, remove any leaves from the rhubarb stalks and discard. Rhubarb stalks can be stored in the refrigerator for 5 to 7 days, unwashed and sealed in an air tight plastic bag or tightly wrapped in plastic. 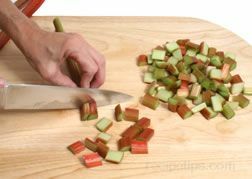 It is best to store fresh rhubarb in whole stalks because cut or diced pieces will dry out more quickly. Trim just before using. Rhubarb can be frozen for future use by cutting the stalks into 1-inch lengths and packaging in airtight bags or by stewing first and then freezing. 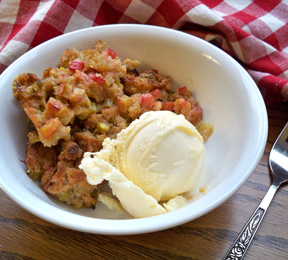 Rhubarb does not need to be sweetened before it is frozen. 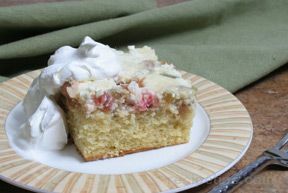 Field-grown rhubarb is grown outdoors and has a more intense flavor and a coarser texture. It generally has darker red stalks with green leaves but there are varieties with green stalks tinted with pink. The green variety produces more rhubarb when harvested than the red variety. Hothouse-grown rhubarb is grown in a greenhouse and is more tender, with a milder flavor. 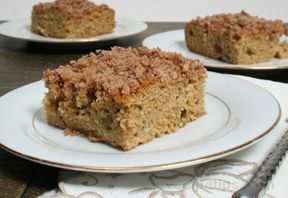 It is also slightly sweeter than field-grown rhubarb. Hothouse-grown rhubarb has pink colored stalks with yellow leaves. 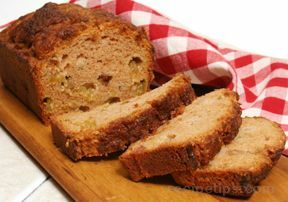 One pound of rhubarb will equal approximately 3 cups of chopped and 2 cups cooked. A 12 oz. package of frozen rhubarb equal approximately 1 1/2 cups. 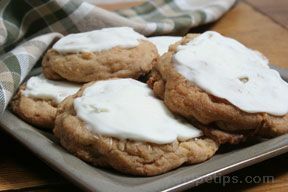 Rhubarb can be substituted in most recipes that call for cranberries. Combining rhubarb with sweet fruit, such as apples, oranges or strawberries, will help reduce the amount of sugar needed to sweeten the rhubarb. 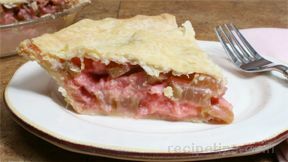 Rhubarb can also be sweetened with honey, corn syrup or maple syrup.